Waste haulage and disposal specialist Cleansing Service Group (CSG) has taken delivery of a new batch of vehicles in the latest stage of its £12million fleet replacement programme. The four range-topping DAF XF105 articulated tractor units, which feature super space cabs, will boost the Fareham-based company’s specialist waste tanker fleet which is already the biggest of its kind in the UK. The latest delivery also includes three new tanker trailers – a 6,000-gallon glass-lined trailer suitable for the transport of acid waste, a 6,000 gallon stainless steel unit and a further 7,000 gallon aluminium trailer. CSG announced last year that it planned to replace its entire vehicle fleet over the next five years. The cost of its latest delivery is around £560,000. 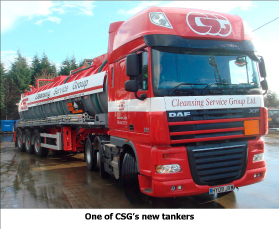 The new tankers will support the company’s position as the UK’s leading liquid waste collection provider. CSG also operates the sector’s largest industrial aqueous waste treatment facility at its award-winning hazardous waste handling centre at Cadishead near Manchester. CSG is expanding its range of services to leading UK forecourt operators, where it carries out drainage system maintenance programmes, and all four new tankers have been designed to meet national Petroleum Regulations.